CCMH is pleased to announce the launch of a new, secure patient identification system that will help prevent medical identity fraud, identify duplicate records and improve patient outcomes. We have partnered with CrossChx, a leader in healthcare intelligence solutions. The IT department will be installing their Connect biometrics system throughout our registration areas to help solve medical identity resolution issues. The system is very simple to use, requires very minimal training and has been universally accepted in other health systems. CCMH has become an early partner in this technology and we expect other health systems to follow our lead very soon. How Does Connect Biometrics Work? 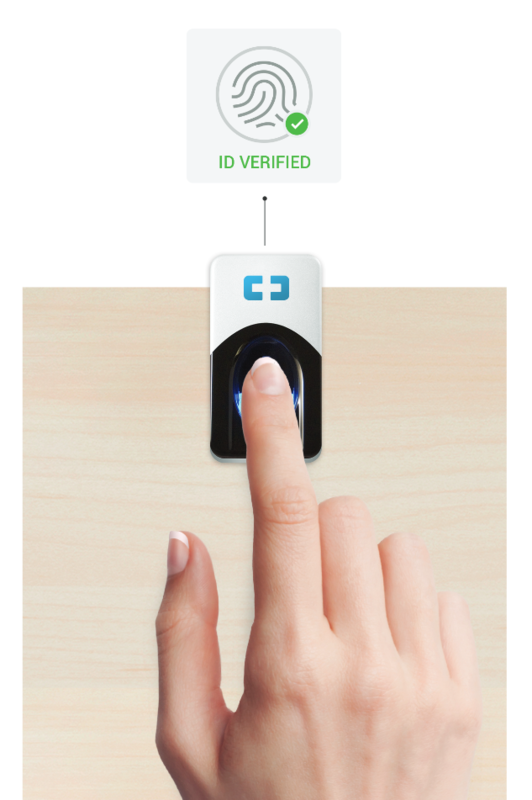 Using a fingerprint scanner, Connect biometrics instantly verifies patient’s medical identity and links the patient to their medical benefits so no one else can use them. Connect biometrics will ensure that the right person receives the right care. While the system is not mandatory for patients, we should encourage all patients to use the system to further protect their medical identities. To date, CrossChx has protected more than 60 million patient identities at other health systems with an acceptance rate of more than 95 percent. There are many long-term advantages to this new technology which we expect to benefit from in the near future from quicker patient registration, easier access to patient medical records, decreased administrative burdens of duplicate or incorrect records, quick and accurate patient identification in emergency situations and much more. While patient participation is voluntary, staff participation is required. All registration staff must offer and encourage the use of Connect biometrics to any patients 5 and above. Should a patient choose not to use CrossChx to further protect their medical identity, the software has a simple way for you to capture their decline reason and further assist in the development of this program. The leadership team is asking for your support as we roll this program out. As with any new program, there will be many questions from you and our patients. CrossChx is an active partner with CCMH and will be providing regular support to our staff. We believe that our partnership with CrossChx has great potential for both our patients and CCMH. We thank you all for your support!